Torquay - Travel by train - Torquay Station, Rathmore Road, Torquay, Torbay, TQ2 6NU. Customer service 08457000125. CCTV. Ticket office. Waiting rooms. Refreshment facilities. Pay phone. Toilets. Wheelchair accessible toilets. Only parts of station step free access. Wheelchairs available. The railway is about 1/2 mile from the town centre. Also see Torquay tourist and travel information. Station 0.1 miles. 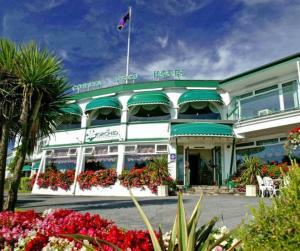 On the Torbay seafront, Grand Hotel has an AA Rosette-awarded restaurant and a gym, with majestic views over the bay. Torquay rail station is close by. The Grand Leisure Club has a sauna, a tennis court and an indoor pool. There is also an outdoor pool with a sun terrace, a jacuzzi and a beauty centre. Many rooms at the Grand Hotel have views of the Torbay coastline and some have balconies. There is free Wi-Fi and free parking. Gainsborough Restaurant serves a fine menu of local produce, while the Compass Lounge offers a varied snack menu. In a quiet road overlooking parkland and trees, a 3-minute walk from Torquay's seafront, The Colindale is a Victorian guest house with 4-star status from the AA. The Colindale is a very welcoming place to stay in Torquay. Each of the individually decorated bedrooms is en suite, with access to free Wi-Fi internet. The comfortable guest lounge has a TV and is a good place in which to relax quietly with a glass of wine. There is a selection of books and videos that you can borrow during your stay. 200 yards (180 metres) from Torquay Rail Station, The Colindale is half a mile (800 metres) from the English Riviera Centre and Princess Theatre, and three-quarters of a mile (1.2 km) from the harbour. This small, family-run guest house is 500 metres from the seafront and a 300-metre level walk from Torquay train station and the English Riviera Conference Centre. The non-smoking, licensed guest house is situated next to parkland in the heart of the English Riviera. It is a 2-minute walk from Torre Abbey and Gardens, and a 10-minute scenic walk from the marina and town centre. There is ample parking, an outdoor heated swimming pool and a bar. The Parks is pet-friendly and has disabled access. Each room has an en suite bathroom and many rooms are family-size. Station 0.7 miles. Situated in the leafy lanes of Chelston, we are 750 metres from Torre Abbey Sands and a short journey from the harbour and town via a bus that passes our door. The Red House Hotel is a small, comfortable and well-appointed family hotel with extensive leisure facilities including indoor and outdoor pools, a sauna, a spa bath and a gym. The pool lounge is particularly pleasant, with patio doors opening onto the garden and large picture windows overlooking the indoor pool. Chelston is a charming, tranquil area of Torquay, characterised by its large red stone Victorian villas and village shops. Chelston is very close to the local beaches and a 5-minute bus ride from the town centre. Station 0.3 miles. Welcoming couples and families, this superb Hotel is situated in a quiet location, a few minutes' walk from Torquay seafront, the town centre, Torre Abbey and the English Riviera Conference Centre. The hotel provides free car parking, a large private garden, an outdoor heated swimming pool (seasonal) and boasts a superb in-hotel restaurant. 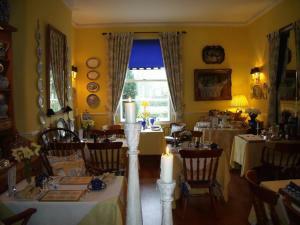 It is decorated in a distinctive fashion, with views over the garden and to the sea. All of the spacious bedrooms have en suite facilities and are totally non-smoking. They are decorated to an excellent standard, including quality beds and furnishings. Breakfast and dinner includes specials and homemade items, always using high-quality ingredients and fresh local produce. The train station is about is 500 metres away. A warm welcome awaits you at The Waters Edge Hotel. Set back from Livermead Beach, it has one of the finest positions in Torbay, with unobscured views across the entire bay. The hotel is a short distance from the beach and just 1 mile from the town centre. All rooms are en suite, and the hotel has a restaurant, ample free parking, and free Wi-Fi in the reception area. Just outside the hotel are local bus stops, and buses head to both Paignton and Torquay. Off-road parking is nearby. Station 0.3 miles. With a picturesque seafront location, Livermead House Hotel is an AA 3-star hotel with beautiful sea views, a short walk from Torquay Town Centre with its many shops and restaurants. Offering superb leisure facilities, Livermead House Hotel has 2 outdoor swimming pools and a squash court on site. There is also a fitness gym, sauna and solarium. The comfortable rooms are well furnished, all with Freeview TV and many with stunning views of Torbay. Free Wi-Fi internet access is available in the hotel. Livermead House Hotel's grand restaurant, The Dining Room, serves excellent modern British cuisine, with striking views across Torbay. The Empire Bar is a relaxing place to enjoy a drink and there are pretty garden terraces in the hotel grounds. Guests will find a wealth of activities in nearby Torbay, including golf courses, deep sea fishing and horse riding. Station 0.5 miles. This charming, family-run Edwardian residence has an idyllic location just 100 metres away from the seafront, the sandy Livermead beach and the quiet, tree-lined meadows of Cockington Valley Country Park. The Charterhouse is in mature gardens with a patio, large lawn and a small outdoor heated swimming pool. The centre of Torquay is within walking distance. The delightful Edwardian building contains light, airy rooms and offers charming, comfortable bed-and-breakfast accommodation. A delicious English cooked breakfast is included. Families are welcome. Pets can also stay, providing you are booking either of the 2 'pet friendly' garden rooms. There is a large, free private car park and free Wi-Fi internet access is available. Station 0.6 miles. The Capri Guest Accommodation is walking distance from the beach, marina, Torre Abbey Gardens, the town centre and the Riviera International Conference Centre. The Capri offers home cooking, 9 en suite rooms and a lounge area. Optional 3-course meals are served in the dining room, and snacks and drinks are available until 23:00. Torbay's main attractions are close by, and the Capri is on a main bus route to Paignton, Brixham and Babbacombe. Paignton and Torquay are within walking distance. The family-run guest house offers a warm and friendly stay, and can provide local information. Activities such as cycling, golf, fishing, tours and diving can be arranged. The Capri offers a permanent 10% discount off the final bill for all senior citizens (proof of age maybe required. Station 0.5 miles. Welcome to the award-winning Corbyn Head Hotel where superlative cuisine is only matched by the superb views; relax and enjoy the talk of the West Country. From its magnificent waterfront setting, this AA 77% quality rated hotel and restaurant with 3 AA Rosettes, enjoys uninterrupted sea views across Torbay; with one of the most envied positions in Torquay. With 45 comfortable bedrooms, many with sea views, this hotel is not to be missed. Just a stone's throw from the sea, a minute's stroll to Livermead Beach and a level walk to the town centre, you could not be more ideally situated to enjoy the very best that the beautiful English Riviera has to offer. Other awards for this sea-front hotel include the English Tourism Council's Silver Award and RAC Dining Awards, so a very high level of customer service can be expected. Station 500 metres. With stunning sea views, this is the only 3-star hotel in Torquay situated directly on the waters edge, with direct access to the beach from the spacious lawns. The Livermead Cliff Hotel has stunning sea views from many bedrooms and all of the public areas. Just in front of the hotel is a landscaped garden and terrace and the sea is just beyond. The sea-view rooms truly make the most of the hotels superb location and some have access to a shared balcony. A set of private-access steps lead down to the secluded Livermead Sands. The town centre and the marina are just a pleasant, level walk along the seafront from the hotel. Torquay rail accommodation. Station 2.3 miles. The award winning family run detached licensed hotel with a warm friendly welcome in a great location.